When I get emotionally overwhelmed, I don’t really cry. My lips will start shaking and I get the feeling that I can’t really hold my smile anymore, but only my bottom lip does the quivering. I look at the people in front of me. People looking at me from three levels. And I’m not nervous as I had been before, thinking how I had to congratulate the 3de and the winner. I stand there before a crowd and I feel as though I belong. Like I’ve been standing there the whole time and it is completely normal. The first time I stood on an international podium, I didn’t feel like that. I felt uncomfortable, shy and out of place. But this here was different. I was filled with emotions and I didn’t feel any irritation. I was happy and this is what I want to experience more, even if I have to take the shaking lips with it. We had arrived at the climbing gym Friday and we had already looked at the routes and imagined which one would be ours. I had thought that the orange one would be ours, but the next day after having waited a long time, we saw that I had the two green routes that looked like they were built for kids. My first route was on the left from the middle of the wall. That one looked quite okay. I warmed up and tried to keep my calm, but when I sat on the seat in the front tying my shoes, I realised that I was nervous. Starting I did okay for my nerves, but I was on shaking legs and where I fell, if I could have lost the nerves there, maybe I would have held the hold. While climbing, I realised that those nerves were because I had done so well in Imst. We went to the hotel and there I slept for 30 minutes strait and Charlène had to wake me up 5 minutes before we had to go back. The second selection was the other green one, this one was to the complete left side of the gym. It was also a bit more technical and built for a smaller size. My first selection was for the B girls so I read my first route with Lucy, Pauline and Charlène. Helping them out is really fun and in return they read my second selection (their first selection) with me. I had a lot of trouble climbing that route. First of all, I was too tall for every move and had to squeeze myself through it. I had trouble in every part of that route and when I finally got close to the top, I was too pumped from all the moves I had to pass to get there. The results were posted 5 minutes after I had climbed since I had climbed last of my category and I came in a tie for 6th place. The rest of that day was just waiting for the other climbers to finish. It was very hot and Chris, now deemed the best coach in Belgium, proposed to go swimming in a nearby river and he even allowed the finalists to go. We went to the hotel, changed into our swimming suits and then went back in the car to drive to the river. The water was good and not even cold. We swam and then the finalists, me included sat on the riverbank. Then we went back to the hotel and ate and went to bed early. Waking up the next morning was difficult and I was really tired and couldn’t get my mind to wake up. When I started warming up, my mind was still asleep. But when I had to read the route, I was awake after actively thinking about it. 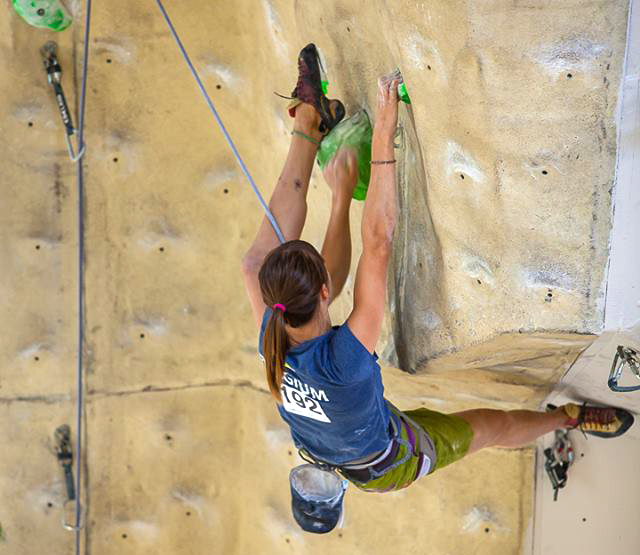 This time, our team had 3 climbers in the finals, Sven, Lucy and me. Lucy had the same final route as me but we couldn’t read together, because we could only read the route when the B category had finished climbing. My turn to climb. My nerves were better than in the beginning of the day and while climbing I had some fun. In this route there was also a turn and there I did a no-hands knee bar. It was so awesome, because after that I didn’t lose concentration like all the other times I had done a no-hands knee bar before. This time, I could continue climbing. I did a good job. I was first and everyone fell on the same move but because of the count back I became second since one girl managed to hold on to the next hold.